Last August, Jenny of Chronicles of a Nursing Mom asked me to submit an article on how I freeze my breastmilk and also on how to thaw frozen breastmilk. I guess it’s helpful since I’d get email re the post. I went to re read the article recently and I felt it was so gulo (sorry Jenny, I was rushing when I did it that time). Here’s my attempt in make it better. I first pumped at 5 weeks but got around half an ounce and this scared me. Afraid it might affect my milk supply as I started doubting my output I stopped pumping first. I tried it again after two weeks when I was more confident, still I got only around half an ounce to 1 ounce the first few times but it steadily increased, I was determined as I know I can’t go out if I don’t have stored milk at home. I figured an ounce a day will still be 7 ounce in a week which is still 4 hours worth of time out of the house. I would pump as soon as I wake up (I pass baby Laya to yaya when Laya is awake anytime between 6am-10am and then sleep til around 11am-1pm) this session is when I get the most milk (averaging 3-4oz); again I pump in the afternoon before dinner or when Laya is asleep around 2-4am. If I go out then I pump every 3-5 hours. As out put increased my aim was to get at least 5 oz saved each day. This went on from the time Laya was 2 months to maybe 5 months old, I stopped and just pumped once a day when my frozen milk reached more than 300 oz already and I didn’t have freezer space anymore and even my friend’s freezer were full na. Am sharing this because seeing them packed so nicely encourages me to pump and save. It is also easier for everybody when it is time for baby to use the milk. I love counting how much milk I have, that was one of my motivation for pumping. I was thinking I could go out for a few days vacation and leave baby behind if I want to. How do I pack and freeze my milk. I repack milk for freezing whenever I have the chance which is usually at 6 oz to 14 oz roughly every 2-3 days. I try to leave expressed milk in the ref for Laya to use (milk heirarchy is direct is best, next is newly expressed milk, refrigerated one then last is frozen ones) but I also do not wait till there is a lot before I freeze as the more bags I freeze the longer it takes them to get frozen, besides I do not have a lot of flat space in our freezer. 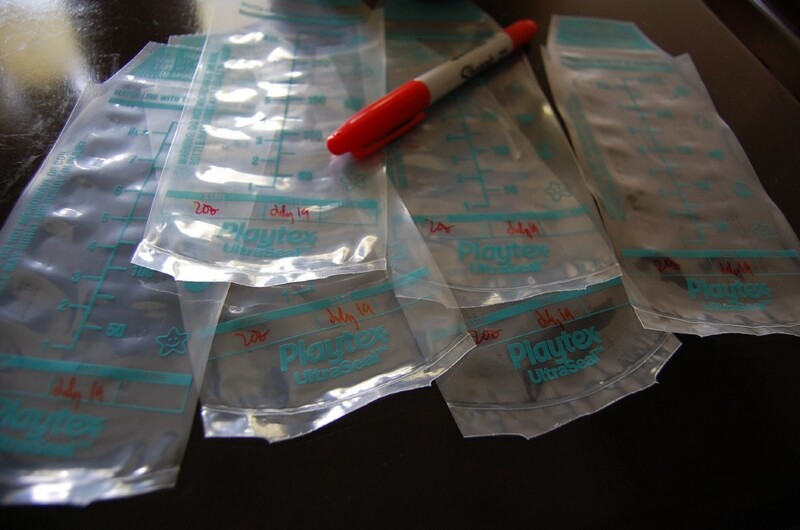 Next I would measure 2 oz of milk in a feeding bottle and then pour it to the bag, I try to draw out as much air as I can so there wont be air bubble. Then I seal it with a sealer. I leave them upright by leaning it on something so the milk wont come to contact with the sealed area which is hot/warm for a few seconds. After sealing I now place them in a flat surface and leave to freeze. It freezes normally after a day, sometimes over a couple of days if our freezer is full or if I am packing a lot of bags. Once frozen I place them is a ziplock bag, I put 25 bags (or 50 oz.) per ziplock bag. And line them according to date. I also date the ziplock bag so we’d know which bag to use first. I make sure the milk are consumed within three months. Am now back to pumping once a day (after stopping for 2 months where Laya was with me almost 24 hours because we were out of the country and because her yaya was away when we came back). Laya also tasted fresh cow’s milk, I just want her accustomed to the taste. This is a very informative post Ms. Benz.. Thank you for sharing it! Id like to know what did you with the 2 mos you were out of the country? Worry ko kse is when i get back to work and i leave the country 2-3 weeks, do i need to pump ba, store, how can i bring it back home etc..
And will there be a prob with the baby getting back to breastfeeding sa mom from bottle? My baby was 2 years old na when I traveled for 3 weeks at this time so her milk intake is supplementary na lang and she takes fresh milk during daytime, she feeds lang at night or when sleeping. By this time I was no longer pumping na din. She doesnt drink form the bottle, she drinks from the cup. When I came back from the trip, wala as in she fed lang agad agad. In your case, how old is your baby? If you pump kasi you need to freeze them because you will be away really long. If you do pump and freeze then just pack it with ice or better with dry ice in a cooler and check it in with your luggages. If you trip is going to take 12 hours then do not open it until you reach home and ready to put them in the freezer. Bottle to mom problem depends on the baby, some are easily confused others can take it. But if you can cup feed that would lessen a lot of possible problems. You are currently reading Pumping & Freezing Breast Milk at MimmaBenz.com.